You kids today with your video machines and your DVD discs and your Internets — you can see pretty much any movie you want whenever you want (and in some cases, before it’s even been released). When I was a kid, we had to walk uphill, grab the TV Guide, circle the late-late movie shows we wanted to see and then manage to stay awake for ’em because there was no recording the things in those days, and if you missed Invasion of the Star Creatures, you never knew when you’d get another chance. 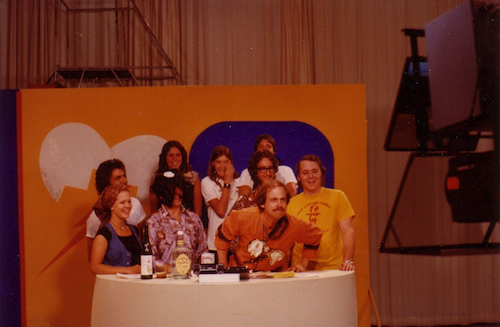 But we also had something very cool that you don’t see much of these days: movie hosts. The classic “horror hosts” grew out of the movie packages that were sold to local stations back in the ’50s. Looking for a way to draw audiences to such “old movies” as Frankenstein and Dracula, TV stations would grab someone with some on-air experience and (in most cases) slap ’em into ghoulish makeup, then have them introduce the movies, usually poking fun at the flicks at the same time. Some of the more famous hosts were Cleveland’s Ghoulardi (whose son, Paul Thomas Anderson, directs such films as Boogie Nights and Magnolia under his “Ghoulardi Pictures” production company imprint), New York’s Zacherley, L.A.’s Vampira (who appeared in Ed Wood’s classic Plan 9 from Outer Space) and, of course, Elvira (who was more-or-less biting — so to speak — Vampira’s schtick). Albuquerque has had her own share of movie hosts, however. There was the late (and very much lamented) “Dialing For Dollars Movie,” but in the more traditional movie host mode we’ve had Elvira wanna-be “Darcinia, the Duchess of Darkness,” “Dickie Bowles and The Bedtime Bombs,” the short-lived “Feverita” and “Dr. Distortion,” who showed some cool movies while shilling for Wally Woofer’s West Coast Sound. I’m sure there were more, but those were — ahem — before my time (the old man said). However, my favorite Duke City movie host by far was KOAT’s “Captain Space.” The Captain (who traveled to Earth in an egg and sported a red jumpsuit several years before Mork from Ork) and his co-host Rusty the Robot showed all manner of cheesy science fiction and monster movies back in the ancient world of the mid-’70s, delivering lots of bad jokes and goofy schtick to keep the folks at home watching. 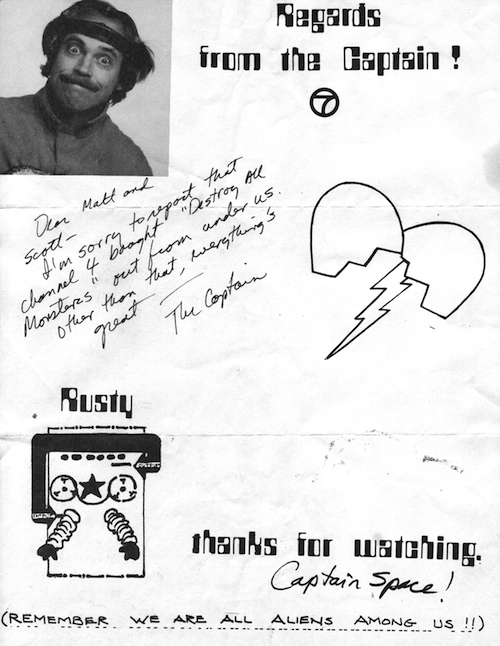 I loved the Captain’s antics (not to mention the movies) so much that I even wrote him a letter, which he not only read on the air but replied to by mail. (I still have his letter, in its tattered envelope). I must admit, there were times where an episode of Star Trek I hadn’t seen would draw me away to KOB, but for the most part the Captain was the king of Saturday Night for me and my pals. After a few attempts in recent years to track down the Captain, I mentioned my quest to local author Bob Vardeman, who not only knew the Captain’s real name, but had actually appeared on the show. With a little nosing around, Bob helped me get in touch with the one-and-only Captain Space (aka Dave DeWitt) for the following interview. What was your background at KOAT? I never worked for the station. Wayne Scheiner and I were independent contractors. We purchased the time from the station and resold it. It was not easy to make a living doing this. What led to the creation of Captain Space and how did you wind up in the role? Wayne and I created the concept and roles of Captain Space and Rusty the Robot. Since I had more on-camera experience, the role of Captain Space defaulted to me. When did the show air and how many episodes were there? The show aired in 1975 and ’76. I would guess that there were about 80 episodes. We would tape the shows Wednesday night for broadcast Saturday night at midnight. Were you familiar with any of the famous “horror hosts” such as Cleveland’s Ghoulardi or New York’s Zacherley? No, I had never seen any of the other hosts, but I think Wayne was familiar with Zacherley. We were more sci-fi-oriented than horror-oriented. Captain Space came to Earth in an egg. How did you feel about Mork from Ork using that same mode of transport on Mork and Mindy a couple of years later? We felt that they ripped us off. But we couldn’t do anything about it. Later, we felt honored that we might have inspired part of that show, which we really liked. Albuquerque author Robert E. Vardeman told me he made an impromptu (and somewhat inebriated) appearance on the show and, from his description, it sounded like it was live. Was this the case? No, we never did the show live. The KOAT engineers running the show would add sarcastic supers to movies to make it seem live. We would use the station’s sets during our bits to give an appearance that it was live. Once I did a Captain Space T-shirt promo in an alley set where I appeared as a drunken bum wearing a Captain Space T-shirt. We were very, very politically incorrect. Did you do any personal appearances as the Captain? Yes. Senator Pete Dominici and I were “locked up” in a fake jail in Winrock Center constructed from cases of Coca Cola. We were only freed after the cases were sold for charity. 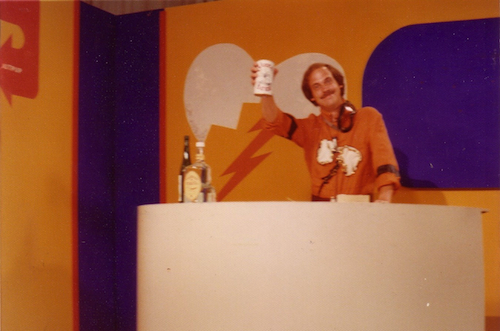 Did you ever fill in as host on “Dialing for Dollars”? No, but I would have if they had asked me. I’m grateful that I grew up on late-night movies, and the idea that nowadays TV stations can make more money by running infomercials than by doing something interesting and cool, like “Captain Space,” really depresses me. Got any good stories from those wild ’n’ wooly days of local television before the deregulation of TV advertising and the onslaught of infomercials? We were controversial because half the people loved us and the other half despised us. I would start the show by reading the previous week’s hate mail. One reviewer of the show, Terry England, accused me of “pushing crap,” namely T-shirts, stereos and sandwiches. Obviously, he didn’t understand the reality of late night TV. He also criticized our lack of quality movies. Well, we had to go with the package that KOAT had purchased, so there were movies like The Amphibian Man, Star Pilot, Star Maidens, Invasion from Inner Earth, Destination Moon and The Alien Factor. He urged us to run quality sci-fi movies and wrote, “He should comment about the films, or find someone who can.” Yeah, like I would do a literary critique of sci-fi films on the air? I don’t think so. The whole point of the show was to be goofy, and we succeeded at that. I still have the Arbitron ratings for February 1976, and we were No. 1 in our time period, beating out Star Trek and Saturday Night Live. You say the show was controversial. Did you ever get any hassles from KOAT wanting you to tone it down? KOAT management left us alone and never tried to influence or censor us — which was remarkable. Are you currently doing anything goofy? Well, for the last 19 years I’ve been the producer of the National Fiery Foods & Barbecue Show, and that in itself is pretty darned goofy — but much more profitable than being Captain Space. Would you be willing to don the uniform (or reasonable facsimile thereof) of Captain Space again–say, for a short film or TV appearance? Sure, but hopefully I’d get paid for doing it. (Note: I’m absolutely sure I had one of those T-shirts).